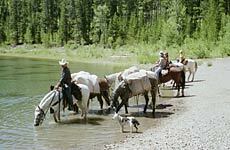 Wyoming Horseback Riding & Pack Trips near Jackson Hole. Enjoy the Tetons, Yellowstone & More! Join us this summer for the horseback trip of a lifetime bordering Yellowstone or Grand Teton National Parks. 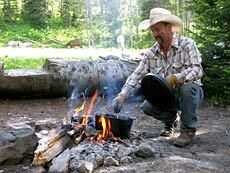 Guided overnight Wyoming pack trips on the west slope of the majestic Teton mountain range. If you like to hike but find discomfort in a heavy backpack, let our horses pack your gear to your drop camp for you. Some of the most beautiful country in the world is right in our backyard. Our Horseback Trail Rides in Wyoming and Pack Trips will introduce you to the beautiful country of Yellowstone and Grand Teton. One of our horseback rides or extended camping trips will definitely be the highlight of your Jackson Hole summer vacation. You can count on our expert horseback guides for a trip that is sure to create memories of a lifetime. We are located within easy driving distance of Jackson, Wyoming, Idaho Falls, Rexburg, and Island Park. See you this summer!